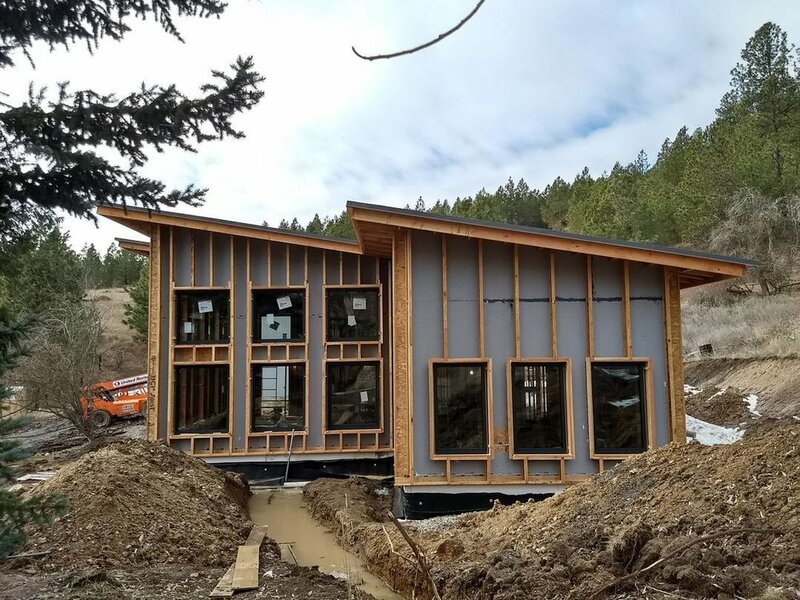 Here are some exterior progress pics of the Passive House off the Palouse. The Unilux windows are all installed (you can see the last three window openings on the side of the garage before those windows were installed yesterday). Unilux windows are a triple paned window system, that offer state of the art performance in energy efficiency, security and sound. Since they are manufactured and shipped out of Germany, the turn around time from ordering to delivery can take some time. On the other Passive House we have under construction (construction on it started a few months after this one) we were able to find windows from a more local source that meet all Passive House standards (and they are even a little more budget friendly too). What appear as vertical lines on the exterior of this house are TJI's (basically floor joists) and afford space on the exterior for an additional 9 inches of insulation, making for a super high R-Value somewhere over 40.